Japan has been importing Dolphins for years now. A select few make it through the hunting for dolphin bait and they send them to 14 other countries such as Russia, Egypt, Korea and other Asian locations. Marine parks pay large sums of money, about 50,000 dollars for dolphins. The ones that aren’t killed in the wild, and aren’t used as bait live very short lives due to stress brought upon them from the separation. This is all for our very own entertainment, which is selfish, wrong and unjust. On Saturday January 18th, 250 bottle nose dolphins were caught in a cove by a group of Japanese fishermen. The fishermen planned to kill them for their meat, or to put them in captivity. The Japanese defend dolphin hunting from the conservationists by trying to explain to them that it is a part of their "culture." A group called The Sea Shepherds Conservation Society found the dolphins on Friday, saving five different pods of bottle nose dolphins that had been driven into the cove. Dolphins would be facing violent capture and shipment processes and killings. Mothers and babies would be torn apart and killed or sent away. This group of conservationists was not about to go down without a fight. At the end of Saturday, the Japanese succeeded by taking 25 dolphins and imprisoning them. The dolphins will continue to be kept there until Sunday where another process will begin. People are gathering and fighting against this cause, making it worldwide. Tweets and videos continue to go up and show the world the horrifying events that are happening at the Taiji Cove in Japan. A doctor on the coast of San Jose was observing the remains of a dead dolphin. Doctor Yaipen-Llanos’s survey shows that he found seven dolphins with evident proof of dissection and harvesting, meaning they had knife marks cutting through their meat and across the bone. The same doctor found more dolphin bones on the coast of Santa Rosa, from April 2012 to January 2013. All of them had marks that seemed to be consistent with butchering. Yaipen also discovered several dolphin burial sites where fishermen have left behind the bones and unusable carcasses. Despite all of the laws against dolphin and other small cetacean hunting, fishermen and other hunters continue to make dolphins get closer to endangerment and are used for food that only causes more stress through mercury poisoning and illness. 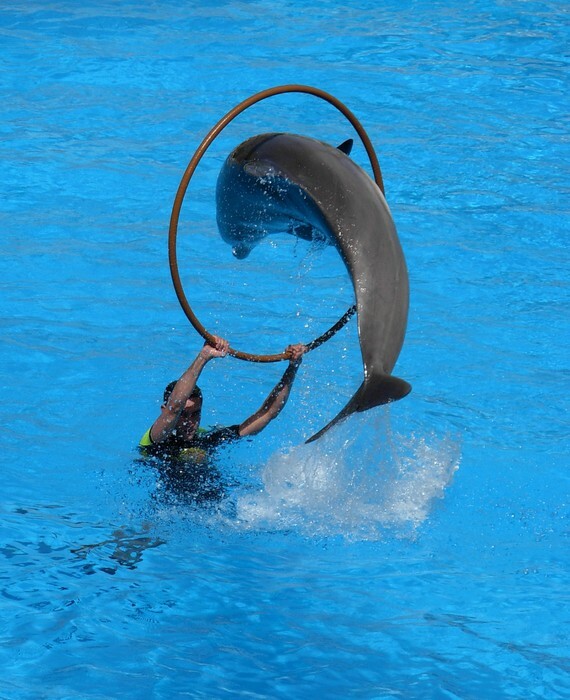 Captive dolphins are forced into doing tricks for Aquariums. These dolphins do not have a choice, and get extremely stressed by this unfortunate culture. Pools are a horrible place to live for many different reasons, one of these being the size of the pools. There is never a truly spacious pool for a dolphin. Dolphins can swim for up to 50 miles a day in the wild, but are limited to a shallow, small pool. The shallow water allows dolphins to get extremely painful sunburns. Dolphins are very social creatures in the wild, which makes living in captivity very hard for them, and causes psychological stress. Trainers will withhold food from these poor dolphins, forcing them to ignore their natural instincts and do tricks for their trainers. They're even taught to beach themselves. 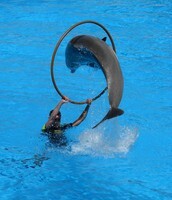 Visitors and tourists love dolphins for their impressive tricks and constant "smiles." What most of them do not know is that the dolphins are not smiling at them, it is purely the shape of their face. In fact, coming to the glass is a plea for help. Captive dolphins are traumatized by their captors and watching their kin die in front of them. 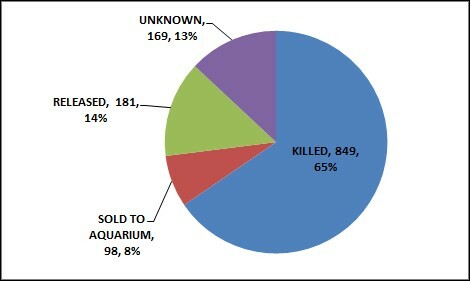 53% of dolphins die within three months of confinement. They also suffer from diseases such as intestinal disease, stress related illnesses and chlorine poisoning. Trainers continue this horrible treatment, with seemingly no regret. 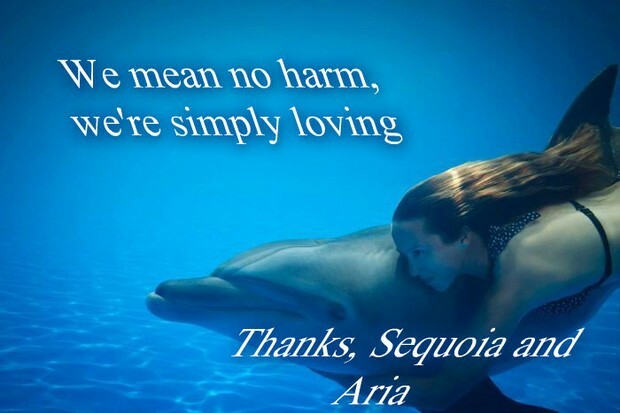 This treatment will continue to progress, and dolphins will continue to die and be forced into doing unnatural things if no one does anything about it. These beautiful creatures are being trained and forced to preform for our "entertainment" when they should be in the wild. They have families and are one of the most smart and adorable animals alive. 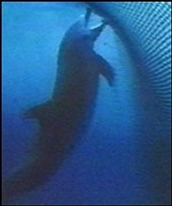 Dolphins aren't only being killed intentionally, but accidently in tuna nets when attaining their own food for survival. Taiji fishermen pride themselves with their 400 year old tradition of killing and hunting dolphins. One of the more traditional ways of killing dolphins is spreading out 12 boats miles apart and searching for the dolphins. When a boat locates a dolphin, it sends out a radio signal. The other boats high-tail over to the signal and align in a single row. They put metal poles into the water and bang on them with hammers, creating a wall of sound. The sound disorients the dolphins and they swim away from the noise. If the men have good luck, the dolphins will swim to the shore, where they are forced into a "funnel" which leads directly to the Cove. Two of the people go and get smaller boats geared with nets. They start to trap them at which point dolphins will jump onto shore to escape. They work hard to conceal the blood, so they stab them in the spine to paralyze the dolphins and put a wooden block in the hole to stop the blood. This doesn't actually kill the dolphin, it only paralyzes it. After that, they tie the dolphins to the boats by their tails and drag them out of the coves, drowning them on the way to the slaughterhouse where they are gutted and cut into little pieces. 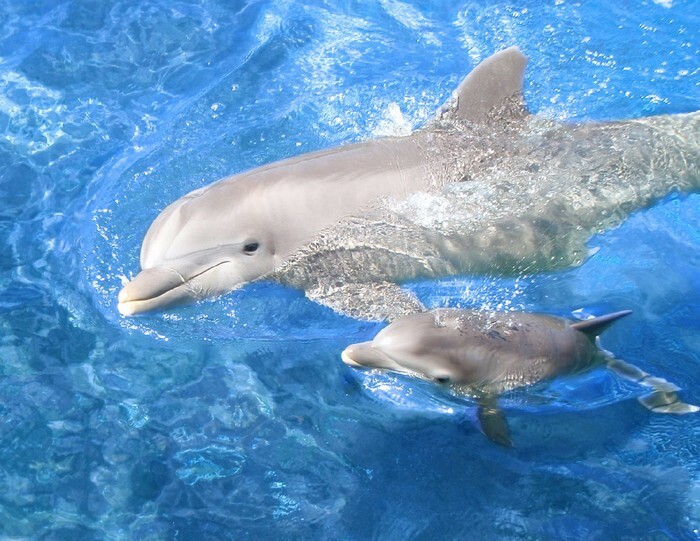 During these hunts, dolphin parents strive to protect their young ones, eventually dying for them. The sad thing, their "protected" young is killed too. Another way of killing them is slashing their skin and letting them bleed to death in the fishing nets they're captured in. Since Dolphin meat is being sold in stores as Whale meat, we're eating dolphin when we make the purchase. In that case, we are signing our own death warrants because there is a very high mercury content in the skin of Dolphins, The workers who process the meat have mercury poisoning from simply touching the meat so frequently. They have poorly kept working conditions so it's very hard for them to not have it. Some of the consumers have been reported hospitalized and sometimes dead from getting the mercury poisoning. This isn't only about Dolphins dying but humans too. Campaigns and protests are common in Japan, especially in Taiji. In 2003, two activists got arrested for releasing captured dolphins from their fishing nets. They were detained for 23 days. Americans have become part of their protests, an American actress, Hayden Panettiere tried to interrupt a dolphin hunt. Her, along with five other surfers from Australia and the US paddled out on surfboards in an attempt to reach a captured dolphin pod. They lasted 10 minutes before being forced back to the beach. They were arrested and sent back to where they came from. Since multiple citizens tend to take footage of the final slaughter of the dolphins, these finales are now often held in tents or under plastic covers, out of sight of snooping eyes. This footage is show often and has become quite popular with news sites such as CNN. How can we help these majestic creatures? There are many small things you can do to help these poor dolphins. Sign a petition at http://www.thepetitionsite.com/3/stop-the-dolphin-slaughter. 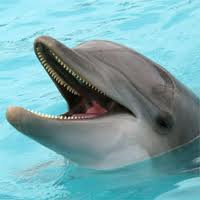 Or maybe adopt a dolphin and keep them from being killed at http://www.oceanconservation.org/involved/adopt.htm?gclid=CP28lfm1sLwCFeV_QgodrAoATQ. There are many things you can do to help these beings. Signing a petition is free and easy. If you want to go to Japan and go out on a surfboard to stop them that would be awesome too. But there are many things online and in this continent you can do too. There are many organizations out there that make it very easy to save these dolphins. Thank you.